These are the three most powerful characteristics of what we label “influencers” in today’s digital world. As we begin 2019, influencer marketing continues to grow as a means for tapping into business growth and explosive brand exposure. The truth is: consumers will always want to hear recommendations from people they trust and idolize—their influencers. Meaning that the trend of influencer marketing is unlikely to slow down any time soon. It’s no longer as simple as the distribution of a few free products to a group of successful Instagrammers. That doesn’t cut it anymore. Influencers are inundated with requests to promote brands, so a free product doesn’t help you stand out. Consumers are immune to obvious product endorsements and they are filtering them out like banner ads. Basically, the influencer marketplace is becoming diluted and brands need to find a competitive edge to tap into the reach, trust, and influence of these individuals. Too many brands are persisting with a hit and hope approach to influencer marketing that is backed by intuition rather than metrics and optimization. This gap is why your campaigns are falling flat and will continue to do so in 2019 unless you make a change. What is the one thing that will change everything? The influencer success equation is simple and it’s no different to any other marketing equation we’ve ever seen before. Success is in the data. The best influencer campaigns plan, track, execute, optimize, and iterate based on important campaign analytics. They leverage data and technology to make smart choices and invest accordingly. Research– Collating multi-channel data about potential influencers across social media, blogs, websites, SEO, and more to determines the best influencers for your campaign. 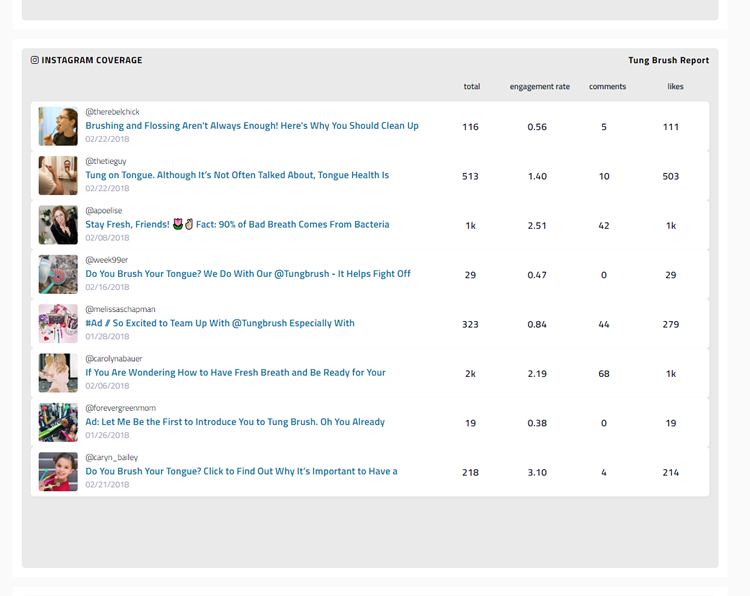 Execution– Tracking influencer message open rates, responses, and conversions will help improve your outreach process. Reflection– Analyzing post engagement and sharing to determine which influencers are most beneficial to your campaign goals. Optimization– Consolidating all of your data from before, during, and after the campaign to iterate and optimize for next time. Ok, so data is important… but it sounds complicated and expensive? As important as data tracking is when it comes to influencer campaigns, the available technology solutions on the market are largely underwhelming. Enterprise-level platforms such as Klear, Traackr, and Hypr are synonymous for charging thousands of dollars a month for contracts that span several years. This is bearable for big brands that consume the cost within a multi-million dollar marketing budget, but what about the rest of us? How do you even begin to justify such crazy commitments for influencer data when you’re fighting for budget with five other departments and five other marketing initiatives? Given the explosion of influencer marketing software in recent years, I’ve had the opportunity to test and review a number of platforms. I’ve checked out the high-end platforms with Enterprise-level pricing, I’ve checked out the low-end platforms targeted at solopreneurs and bloggers, and everything in-between. Recently, I came across a platform called GroupHigh. They’re by no means a new player in this space, but one I hadn’t had a chance to really sink my teeth into until recently. The first thing that jumped out at me when I took a look under the GroupHigh hood was the sheer quality and depth of their data. Access over 50 million websites, with the ability to filter by topic, SEO authority, social following, language, location, and a ton more. 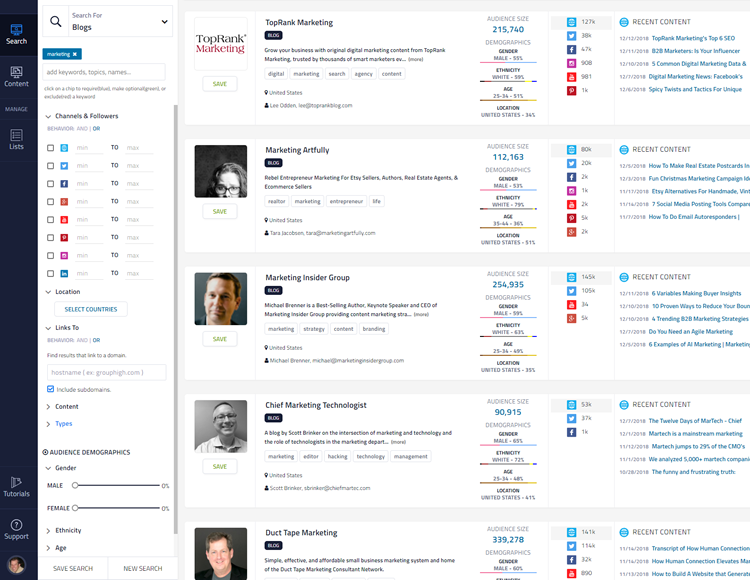 Discover influencers from any niche with search filtering capabilities that you won’t see on other platforms. Automate the research and collection of more than 50 social, SEO, blog, website, and content statistics to make intelligent decisions on who to reach out to. Build visual reports and analyze critical campaign analytics to learn which influencers and content creators really work for your company. One of the best things about GroupHigh, as well as their top-tier data, is their affordable and obligation-free price point. You pay upfront and then the agreement is month-to-month, meaning you can run a campaign, access the data you need, and not get hit with any hefty invoices! Are you ready to capitalize on influencer marketing in 2019? If it’s on the strategic agenda for your business next year, don’t take it lightly. The influencer space is becoming increasingly competitive and the brands who succeed are the ones that rely on data – not intuition—to optimize and improve. Done right, influencer marketing can skyrocket your business into a new realm of growth. Done wrong, you’ll burn through money and destroy your brand in the process.